Sansad Marg. Oak Bhawan, New Delhi. I am directed to say that as per the recommendation of 7th CPC, the Government vide DoES OM No.180S1/1/2017-E.IV dated 02/08/2017 has decided to provide Rs.8,000/- as dress allowance per year to the staff for the purchase of uniform. 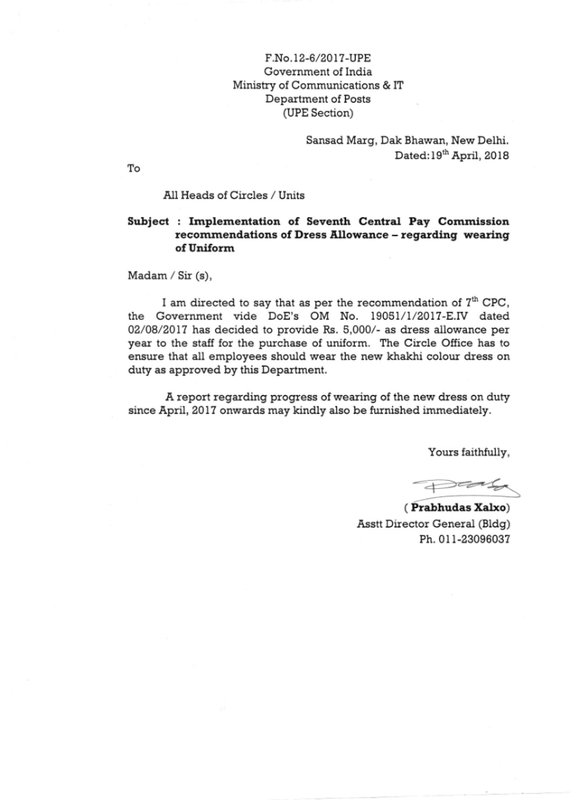 The Circle Office has to ensure that all employees should wear the new khakhi colour dress on duty as approved by this Department. A report regarding progress of wearing of the new dress on duty since April, 2017 onvrards may kindly also be furnished immediately.